Curlique is a new pattern that allows us to use a new ruler by Creative Grids - the 9 1/2 inch Perfect Rectangle. Use this ruler to make a new interesting border for any of your 8 inch quilt squares to add some flare. 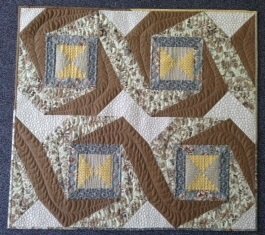 Make the table runner that is described in the pattern or change it up a bit - the way Dee did and make a 4-patch table topper. Includes sales tax. Call 330-644-6100 to schedule.